These pages are in memory of and in tribute to Carol A. Ruggie. They celebrate her love and caring for others, especially the homeless and sick children around the world. Carol died from pancreatic cancer on December 13, 2007. The next four pages depict Carol's memorial service at the Federated Church in Chagrin Falls, Ohio. Read them in order and you'll come to love and appreciate Carol as I have. Thank you, Roger Cram, Carol's fiancée. When Carol Ruggie became interested in a humanitarian project, especially one involving disadvantaged children, she dedicated her life to that cause, immersing and devoting herself until the undertaking became one with her spirit and soul. I remember teasing Carol a little about how she devoured her causes with an insatiable appetite and passion, of how she consumed every waking moment dedicating herself to these kids. Because of Carol's insatiable devotion to her humanitarian causes, I affectionately called her “Ruggie the Raptor” as an indication of her passion. Carol lovingly called me Taz, after the cartoon character the Tasmanian Devil. I asked her if she called me Taz because of my zest and passion helping her with her causes. Carol said, no, I just looked like Taz. In 2002 Carol went to South Africa with Reverend Mark Simone and other members of this church. It was at that time she was introduced to Sparrow Village, the hospice for children dying of AIDS, then in its beginning stages. To continue the service, click on each Sparrow Village photograph and read the caption below. Blow up a 30 foot balloon and cover it with bricks and mortar. Then let out the air, and blow it up again in another location. 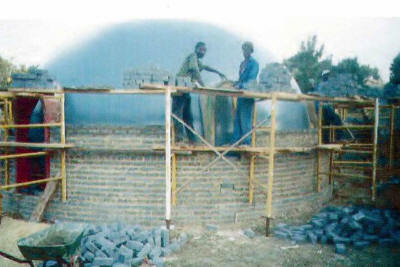 Slide Two: Brick making team working to learn a business and in turn giving services to the village. Sparrow Village was built by the homeless, the unemployed, trained by volunteers in the arts of masonry, carpentry, plumbing, and electrical wiring. Enchanted domes comprise the many buildings in Sparrow Village. Another shot of Sparrow Village. Children of various age groups, all with AIDS, play in their home, Sparrow Village. Carol Ruggie and Reverend Corine, the original founder of Sparrow Village. The entire Sparrow Village from a distance. It was at this time Carol said, “No child should die alone,” which has become the motto for Sparrow Village. Carol dedicated herself to Sparrow Village and promoted it by giving hundreds of speeches at Rotary Clubs in several different states. She also developed a Sparrow Village website that remains today. Carol has made five trips to Sparrow Village. There are now 54 Sparrow Village facilities in 30 different countries. Sparrow Village Slide Eleven through Eighteen: Carol Ruggie and some Sparrow Village children with AIDS. Carol then visited Nederburg Elementary School in Paarl, South Africa. At that time, the school was comprised mostly of male students. In many parts of Africa, girls were not considered worth educating. Carol later invited Mr. Daniels, the principle of Nederburg Elementary School, to the United States, and he visited Carol in her home in Aurora. It was at this time that Carol’s granddaughter, Victoria, played the cello for Principle Daniels who was amazed at what girl’s could do. 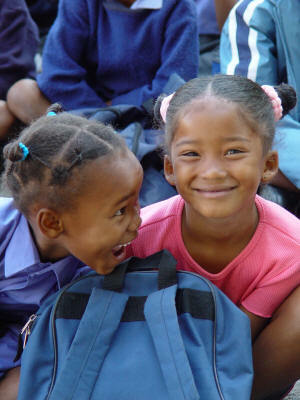 Carol then started a scholarship fund for girls at Nederburg Elementary School. When Carol and I visited the school in 2006, at least half of the students were female. Carol made a positive difference with everything she touched. Let’s take a look at Carol’s children at Nederburg Elementary School. Click on each photograph and learn more about the children of Nedeburg. The children were prayiong for the children in Nederburg that were killed or died the week before. Carol and I attended the Rotary governor’s conference in Niagara Falls in August of 2006. It was here that Carol started turning yellow, a sign of jaundice and the first indication of her cancer. It was also here that Carol and I learned about Children of the Dump in Nicaragua. Nicaragua is the poorest country in the western hemisphere next to Haiti. 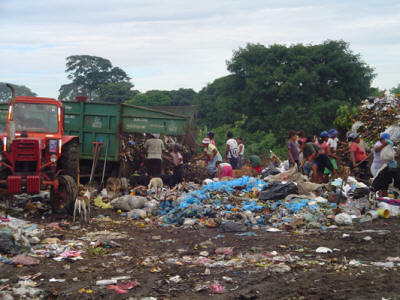 In 1995, many children under 10 years old were found living in the city dump of Chinandega. Since then 2000 kids have been removed from the dump and placed in school where they are given a nourishing meal. Elementary and high schools have been built for their education. Carol and I started a curriculum at Hiram College where students visit Nicaragua and work with these wonderful children. I have just returned from such a trip. Carol and I with Hiram College were working on grass-roots entrepreneurial endeavors for the people involved with the School of the Dump. Let’s take a look at Carol’s children in Nicaragua. Click on each photograph and learn more about this special project. City trucks bring in garbage to the dump. People living on the dump go through each new load looking for items to sell. Water bottles, milk cartons, plastic 2-liter soda bottles and anything else that can be sold at recycling stations is collected. Horses, cattle, dogs, goats, and other animal feed from the dump.